Music plays an important part in the life of both our church communities. People who like singing or who play a musical instrument are encouraged to use their talents for the benefit of those who prefer to listen. Our Music Group meets fortnightly and accompanies church worship from time to time. Making music in a group is very enjoyable. Some of our players are reasonably competent. But those who only aspire to comb and paper or three notes on a recorder are welcome! Practice times are listed on the Month-at-a-Glance page. Do come and join us if you would like to. Our Parish Choir sings mainly for Sunday worship, but also at weddings, and sometimes just for fun. Practice is on Friday evenings at 7.45pm in Christ Church and anyone who enjoys singing is welcome. 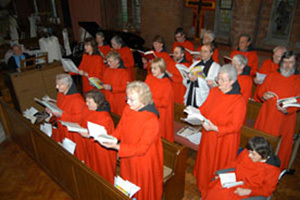 Some of the people now singing regularly in the choir could not read music when they joined. So don't be shy! Christ Church and St Mark's are both used for occasional concerts and recitals. 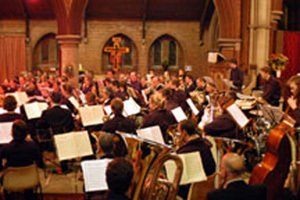 Recently we have enjoyed jazz, wind bands, childrens choirs, organ recitals, solo instrumentalists and silver bands. Details of forthcoming concerts and recitals are on the 'Month-at-a-Glance' page. The pipe organ in Christ Church is a very fine instrument. It was entirely restored in 2005 with the generous help of the Heritage Lottery Fund and the Council for the Care of Churches. 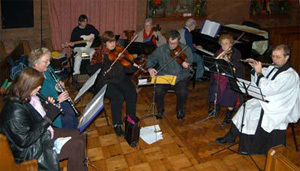 It is used for recitals and concerts and is available for teaching and practice. Click here for more information.